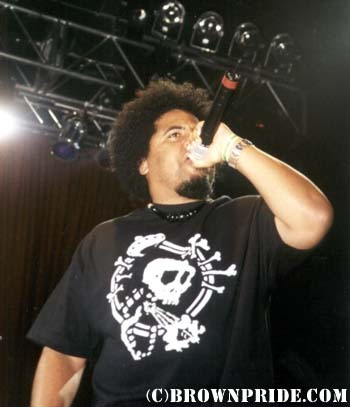 When 4.20.01 came around, we were excited to attend the Delinquent Habits show at the House of Blues in Anaheim. Considered an official stoner holiday, 4-20 is the designated day we honor hemp and celebrate it's useful effects. And that's exactly what went on here... a celebration! The Delinquentes rocked the show with their usual glow- on point and energetic. Perhaps the most touching moment of the night came when Kemo and Ives gave a heartfelt ode to MaryJane before going into the title track of their new album by Station 13 Records, "Merry Go Round". With O.G. Styles on the ones and twos, Delinquent Habits ripped it up in a manner that would have had Mister Walt Disney himself "...passing and ashing on the left-hand side, thinking nothing but good thoughts with way low eyes." Be on the lookout for these guys when they come to your town, and go get the CD right now, Click here to purchase "Merry Go Round" from the BrownPride store.